A 20-hour standoff between Taliban suicide attackers and Afghan and Nato troops sparked another conflict between their spokesmen who attacked each other on Twitter. While shots and explosions rang out across central Kabul, the two enemies challenged each other on the microblogging site. The exchange highlighted the emphasis both sides now place on trying to win the propaganda war and Natoâ€™s efforts to counter a virulent insurgent information campaign. 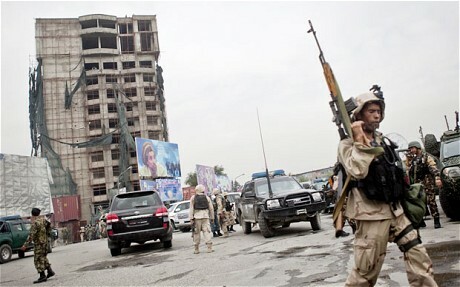 The spat between the coalition press office, @ISAFmedia, and @ABalkhi apparently began when Nato responded to a tweet boasting that Taliban militants were still holding out in a tower block under siege by Afghan and coalition forces. â€œKabul still under siege as battle continues into second day…..â€, posted @ABalkhi, which is one of several accounts tweeting Taliban messages and has a little over 300 followers. The Taliban spokesman, who uses the name Abdulqahar Balkhi on his account, responded: â€œi dnt knw. u hve bn pttng thm n â€™harmâ€™s wayâ€™ fr da pst 10 yrs. Razd whole vllgs n mrkts. n stil hv da nrve to tlk bout â€™harmâ€™s wayâ€™â€ The coalition press office hit back citing a United Nations estimate that four fifths of civilian casualties, which are running at record levels, are caused by the insurgents. â€œReally, @abalkhi? UNAMA reported 80% of civilians causalities are caused by insurgent (your) activities,â€ the coalition, which has just over 11,000 followers, tweeted. The Taliban then questioned the credibility of the United Nations. A team of Taliban spokesmen run a sophisticated propaganda outfit which is in daily contact with Afghan reporters using email, twitter, mobile phones and their website. Propaganda statements claim responsibility for attacks within minutes, though the insurgent reports carry usually inflated and often wholly fabricated death tolls for â€œNato invadersâ€ and â€œAmerican cowardsâ€. By contrast the Nato press office often appears flat-footed and slow. Commanders point out that unlike the insurgents they must take time to check their information is accurate. Twitter has also quickly become the preferred medium for reporting bomb attacks and security incidents in Kabul, with Afghan journalists tweeting details long before news hits television and radio bulletins. By Wednesday evening, the Nato press office appeared to be trying to provoke another exchange with the enemy. Challenging another Taliban twitter account, the coalition posted a link to a video of Gen John Allen, its top general, checking on his troops after the attack. â€œDoes your boss do this?â€ the tweet asked. In recent weeks the coalition has tried to exploit intelligence reports which say Taliban foot soldiers harassed by coalition raids in Afghanistan are bitter their leaders remain in safety across the border in Pakistan.